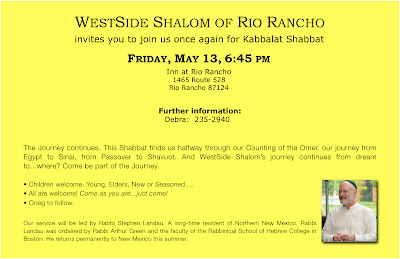 Abq Jew ® Blog: WestSide Shalom! 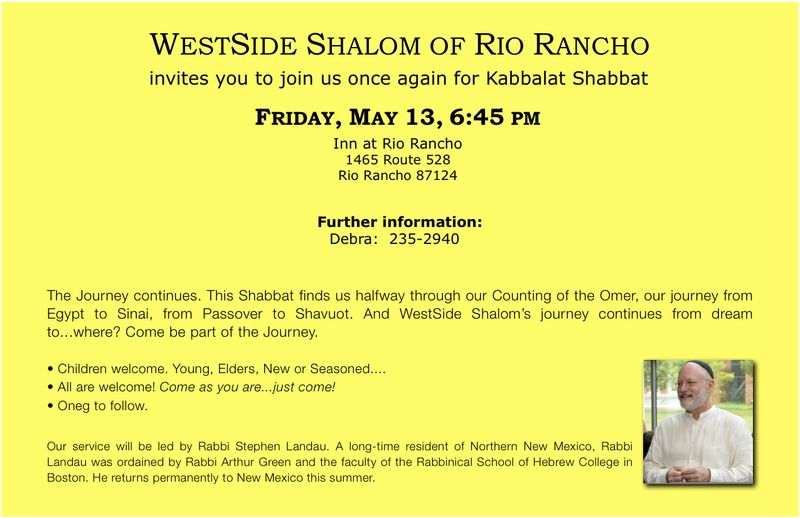 Kabbalat Shbbat in Rio Rancho: A new Jewish community is forming on Abq's Upper West Side, and you are invited to their second Friday night service. The service will be led by Rabbi Stephen Landau. A long-time resident of Norther New Mexico, Rabbi Landau was ordained by Rabbi Arthur Green of the Rabbinical School of Hebrew College in Boston. He returns permanently to New Mexico this summer. Abq Jew participated in WestSide Shalom's first Kabbalat Shabbat service a few weeks ago, and is delighted to report that the turnout was excellent and enthusiastic. And that Rabbi Landau is personable, knowledgeable, and engaging - a wonderful addition to the New Mexico Jewish community. Rabbi Landau Says: Please join us on May 13. Please come and be together with us on Shabbat in your home community. Come as you are. Please lay down your version of ordinary, and come home to the extraordinary simplicity of being together on Shabbat.